It took a bit of sweet-talking, but eight years ago I got myself aboard the city's only fireboat. She was replaced in 2011 with a newer fireboat, the Christopher Wheatley, but not before a final good deed: rescuing a coyote stranded on a tiny ice flow off Fullerton Avenue. Among the 97 firehouses in Chicago, Engine 58 is unique in several ways. Its living quarters are the smallest. Its rig is the oldest, with the last hand-rung brass bell in the department -- or so they claim. And it has, without doubt, the wettest basement -- the channel of water between the Jardine Water Treatment Plant and Navy Pier. Engine 58 is a fireboat, the Victor L. Schlaeger, the last fireboat operated by the Chicago Fire Department, and if you're not excited to carefully hop from the pier onto her 92-foot-long deck on a perfect September morning, then friend, check your pulse, because you're not alive. "It's a floating firehouse," says Relief Lt. Art Jansky, who suggests a look below decks with a very unnautical "You wanna see downstairs?" It has a crew quarters, with six beds -- five firefighters man it 24 hours a day, just like any other firehouse. It has a TV, an exercise bike, a kitchen, two toilets, a shower. "All the comforts of home," Jansky says. Well, a home that moves—another unique aspect. Engine 58 is the only company that takes its firehouse out on runs. Also a home with four water cannons— "deck guns" they're called—two fore, two aft. The Schlaeger's deck guns have any truck in the department beat— the best a hose from a rolling pumper can do is 400 gallons a minute, while each of the Schlaeger's guns spews forth about 1,200 jetting, hissing, foaming gallons per minute. They have to take care, fighting fires on smaller boats, that the force of the water doesn't sink them, or spin the Schlaeger around. "These things will move the boat," said Engineer Dwain Williams. They took the fireboat out by the breakwater, and invited me to operate the deck guns, turning the big chrome wheels that raise and lower the gun and sweep the horizon. They didn't have to ask twice—maybe you need to be a boy to truly appreciate the thrill of cranking up that 4-foot-long barrel and watching the powerful stream gush forward. All that was missing was a fresh snowbank to trace my name in. The Schlaeger was built in Sturgeon Bay, Wis., in 1949. She is by no means a beautiful vessel, riding low in the water, her smokestacks cut short, the better to go under low bridges. She can float in seven feet of water, and her eight engines will push her to 14 knots. With bow plates made of steel nearly two inches thick, she'll break through eight inches of ice. In the winter, bubblers keep the water ice-free 20 feet around her berth, in case the fireboat needs a running start. "It's a little old, a little tattered, but you know what -- this puppy is sound," Williams said. "It'll do the job." It's hard to find a job that the fireboat hasn't done over the years. It has fought fires, of course, on water and on land, including a massive 5-11 warehouse blaze on the Southwest Side 10 years ago. But it is also a platform for divers, and has rescued people from sinking boats and downed helicopters (including a Fire Department helicopter that crashed attempting a rescue). During heat waves it pours water on downtown bridges to keep them from swelling closed. In the parched summer of 2005 it watered riverside trees. On the Fourth of July, it parks next to the barge setting off the fireworks over the lake, just in case. And of course no festive waterside event is complete without the Schlaeger firing its cannons high into the air in watery salute. Talk about gushing. Nor is its range limited by the reach of its cannons—the Schlaeger has eight discharge outlets and a bellyful of hose, used to connect with land companies. The boat's six pumps can move 14,252 gallons per minute. "We become a fire hydrant and can supply 10 engines," Williams said. The first Chicago fireboat, the Geyser, was commissioned in 1886. At one time there were five fireboats protecting the grain elevators and factories along a Chicago River spanned by wooden bridges. 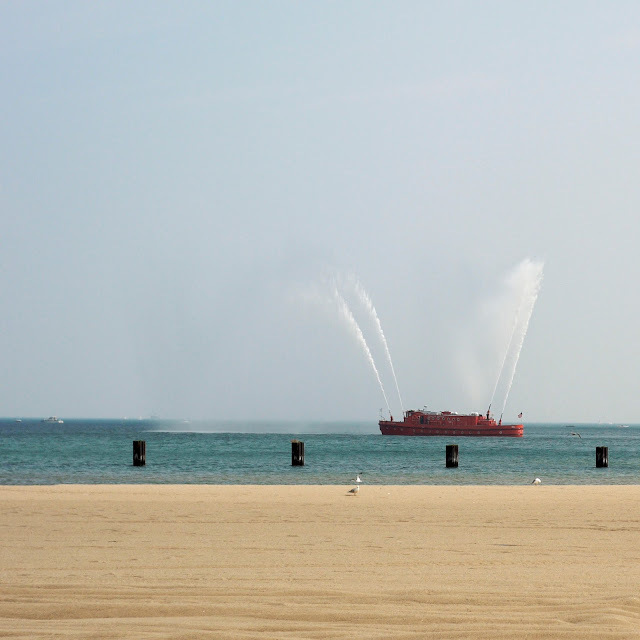 The Schlaeger has been the only fireboat in Chicago for more than 10 years ever since its sister vessel, the Joseph Medill, was decommissioned and exiled to Wisconsin. A fireboat is one of those budget items that make cost-cutters' fingers itch—it doesn't make as many runs as a regular engine company, and has all the hole-in-the-water-you-fill-with-money drawbacks associated with any boat. But when you need a fireboat, you really need it, and I can't help but think that the increasing number of residents living along the riverfront must sleep a little better at night high above the city in their luxury condos knowing that there are five guys sleeping below decks on the Victor L. Schlaeger, ready to help at a moment's notice. Nobody aboard Victor L. Schlaeger, the boat, had any idea who Victor L. Schlaeger, the man, might have been. I promised I would find out. Born in Chicago, a graduate of Bowen High School, Schlaeger became a powerful Cook County Democrat, known for his efficiency, who worked his way up through government -- to county treasurer and chief clerk of the Superior Court -- before being elected recorder of deeds, the position he held in 1949 when he collapsed and died during lunch at the Bismarck Hotel. The boat, commissioned a few months later, was named in his honor, perhaps because he served in the Navy in World War I. Did you have to take Dramamine to ride this, NS. Certainly would be an interesting trip. He must have been eating heavy lunches, Victor that is. I'm often jealous of you, Neil, for the many amazing experiences that you get to have as part of your job. Thank you for this article. My husband's mother's uncle was Victor L. Schlaeger. It's nice to know some of the family history.